Which weather pattern brings the most snow to Vail? Here’s the answer right up front: A wind blowing from the northwest usually drops the most snow on Vail, and most of Vail’s deepest powder days occur when a northwest wind is blowing. If you remember almost nothing else from a weather discussion about Vail Mountain, just remember that a northwest wind is your friend if you’re seeking powder! Wind direction is one of the most important pieces of information when attempting to forecast snow at big mountains. The reason for this is called Orographic Lift, which is a technical term that describes air that flows along, hits a mountain, and is forced to rise up and over the mountain. When this air rises, it cools and the moisture in the air may condense into precipitation (hopefully snow!). The lower-elevation terrain to the northwest of Vail is one reason why Vail gets a lot of snow when the wind is blowing from the northwest. Air that blows toward Vail from the northwest is blowing over an area of flatter land, minding its own business, and them bam! – the air hits the mountains around Vail and is forced to rise, creating snow. 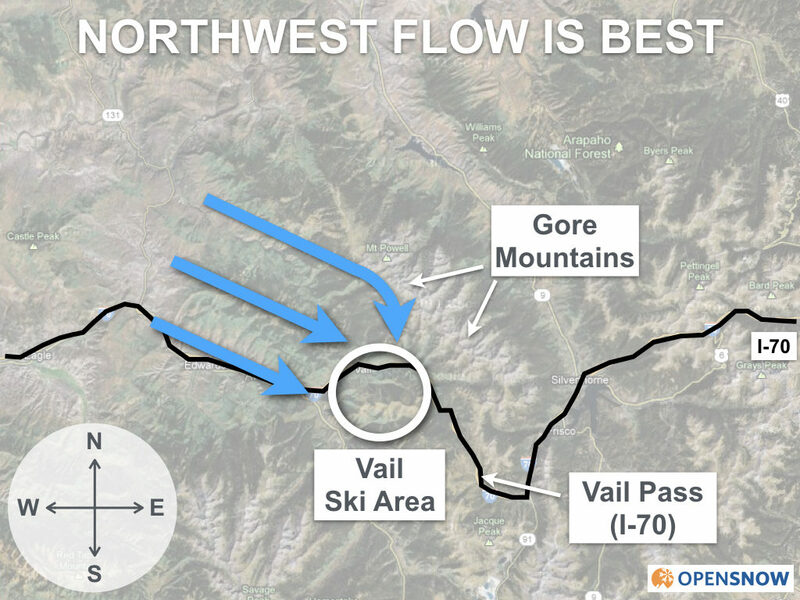 Another very important reason why Vail receives a lot of snow from a northwest wind is the position of the large Gore Mountains just to the north and east of Vail, as shown in this map. The Gore Mountains help to funnel a northwest wind toward Vail as I show with the curving blue arrow. When the wind flows toward the Gore Mountains, some of it is deflected toward Vail, and this deflected air acts as ‘extra’ air that hits Vail and is forced to rise. More rising air equals more snow, as long as there is sufficient moisture in the air. It is true that storms moving toward Vail from any direction can bring healthy snowfall. But more often than not, we can give thanks to the combination of a wind from the northwest, the flatter terrain to the northwest, and the Gore Mountains for making the deepest powder days. Did I say “northwest” enough times for you to remember? I hope so, because that’s the magical wind direction for Vail!